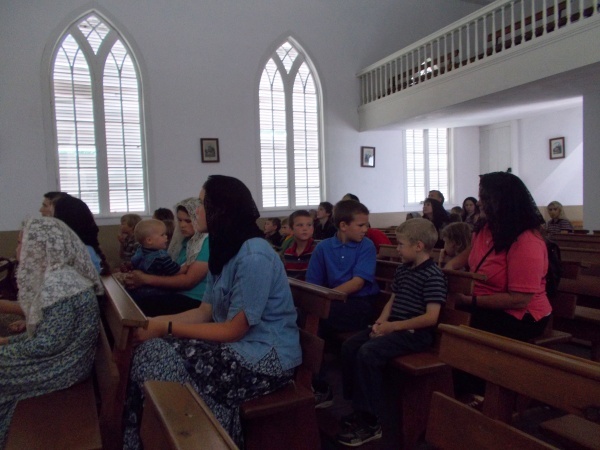 Saint Augustine’s in New Diggings is a restored pioneer church in a former lead mining boom town. It was built by Father Samuel Mazzuchelli. 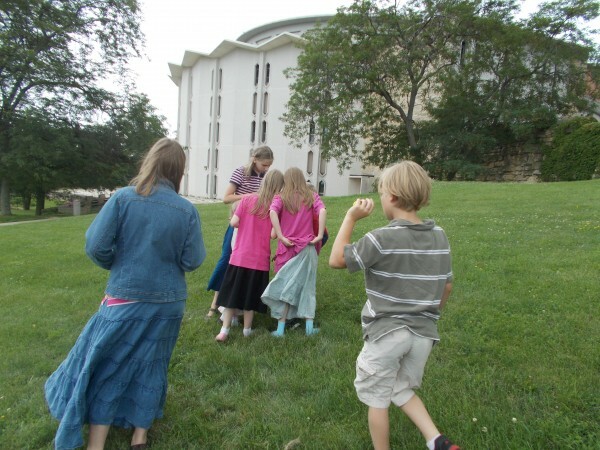 This was the first stop on today’s field trip for the Immaculate Heart Homeschoolers, a local Madison, WI-area group. It was my pleasure to get to go with them. George Burns is a Knight of Columbus of the Mazzuchelli Assembly. He was involved in the process of the church’s recent restoration and he gave a talk about Father Mazzuchelli, how he came to Wisconsin from Italy as a young Dominican friar and became an astonishingly energetic and productive missionary and builder of churches [click to read the story of Fr Mazzuchelli that I wrote for children–it’s also a useful introduction to him for adults]. 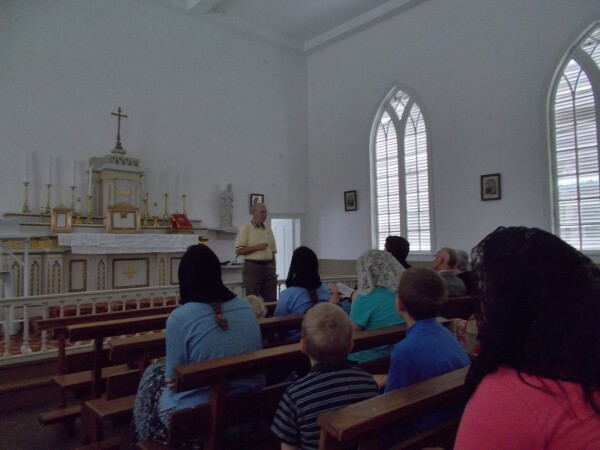 The Knights of Columbus restored this precious building to original condition. They’ve done an amazing job; next they want to build a visitor center. Mr. Burns told us the choir loft is very strong to this day because it is supported by ONE huge solid log that spans the whole width. You just cannot get logs like that now! 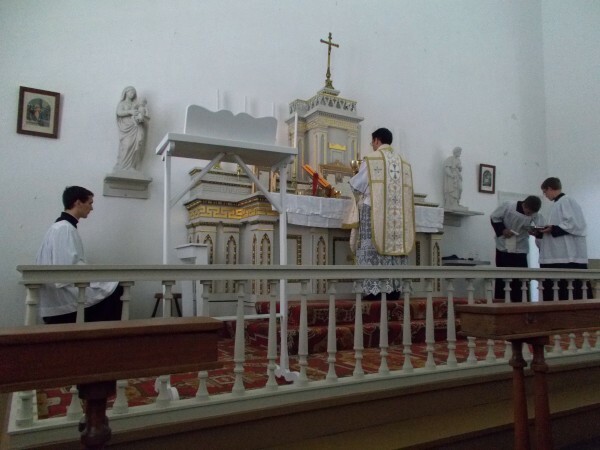 …a Traditional Latin Mass, very much like this altar was intended for when Father Mazzuchelli built it! Two homeschooled boys were servers. We also had a seminarian of the Priestly Fraternity of Saint Peter with us, Jonathan Heinricy. 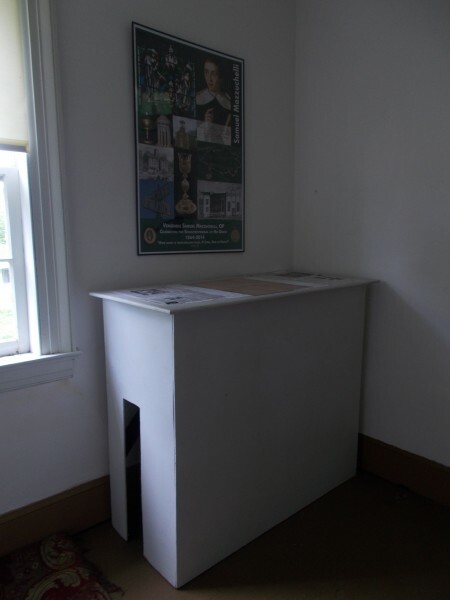 Even though the historic altar that Father Mazzuchelli celebrated Mass on was lovingly restored, nowadays when a priest wants to say Mass he puts this wooden structure over the Communion rail in order to use it as a temporary altar for Mass facing the people. Before Mass Jonathan the seminarian realized Father Alex hadn’t brought any bells, but he had a good idea. 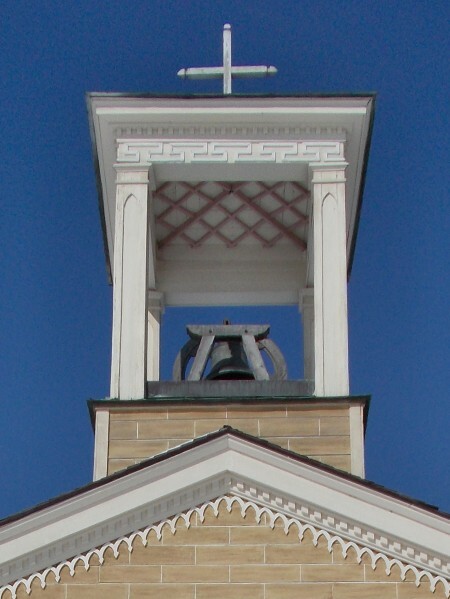 The church itself has a bell! He asked George Burns, the good Knight of Columbus. George was happy to ring the old bell during the Consecration. George hadn’t been to the old Latin Mass since he was a boy. And George, who was taking our picture in the other picture. 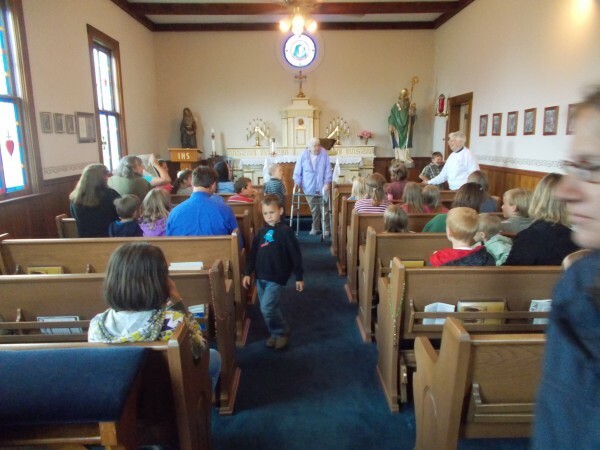 Next we went to Saint Patrick Parish in Benton. 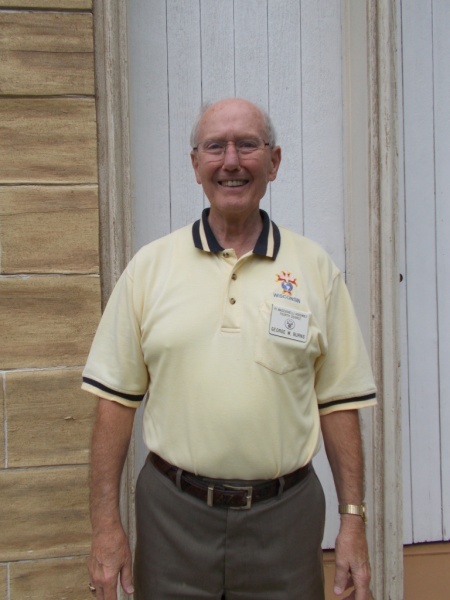 This was another parish Father Mazzuchelli founded, and where he spent the last years of his life together with the first Sinsinawa Dominican Sisters, whom he had founded and who ran a girls’ school in Benton called Saint Clara Academy. 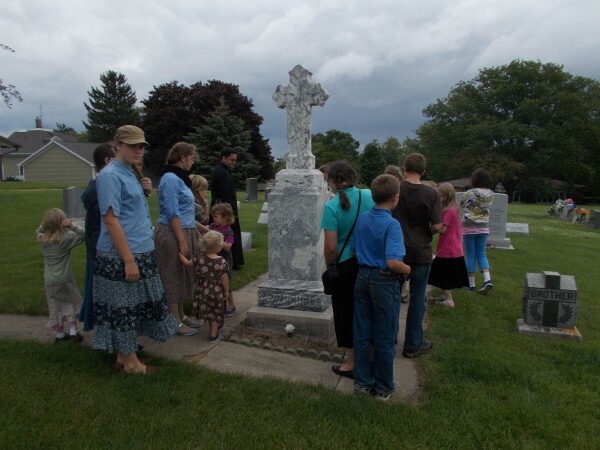 Two nice Sinsinawa Dominican Sisters spoke to us about their beloved founder. 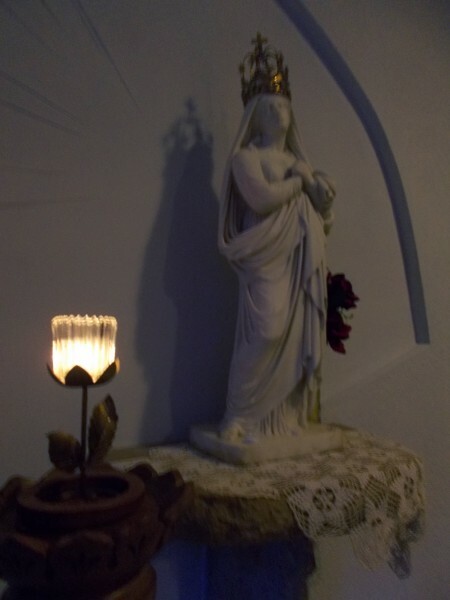 This is the Mother of Sorrows Chapel, where they have another one of Father Mazzuchelli’s original altars (yes there’s a little table altar in front of it that is the one they use for Mass… with some older Catholics there’s a huge taboo against having Mass with the priest and people facing the same way toward God while we worship Him together). Father Mazzuchelli was very devoted to the Seven Sorrows of Mary. 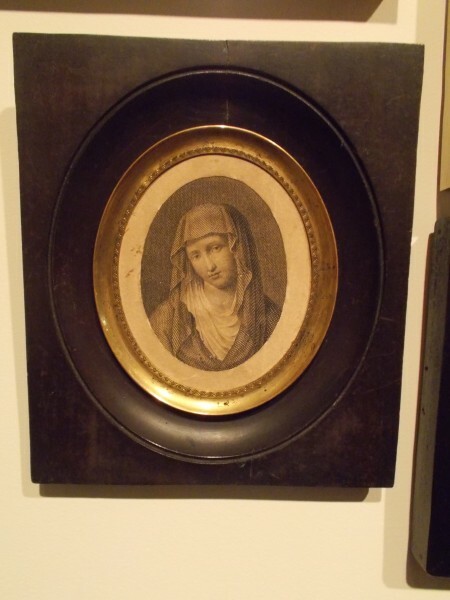 Here is a little image that he kept in his room, which is now in the museum at Sinsinawa Mound. Behind the Church is Father Mazzuchelli’s grave. Sister prayed the prayer for his beatification by heart, and we prayed with her. I like very much to visit this grave and would have liked to linger a bit, except that then it began to rain (briefly). 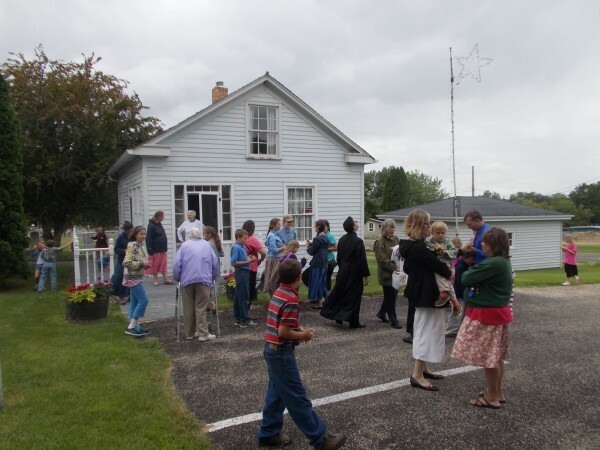 We all hurried over to Father Mazzuchelli’s historic rectory, where there is a little museum to visit. But not everyone can easily hurry. Here is a small lesson in Christianity. It didn’t rain for long! Here’s the little rectory, where Father Mazzuchelli died. 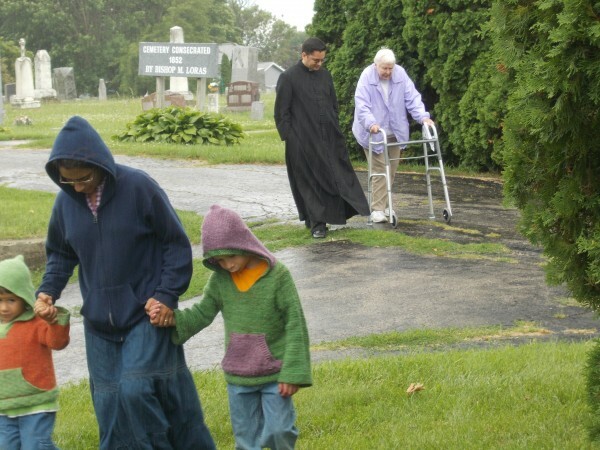 Next stop, Sinsinawa Mound, the motherhouse of the Sinsinawa Dominicans, which had originally been the site of an attempt by Father Mazzuchelli to found a seminary. That’s the famous round chapel in the background (built by Mother Mary Benedicta Larkin in the early 60s–and I’ll have you know Mother Benedicta was a good sister). We visited the museum exhibit about Father Mazzuchelli here, which has the most remarkable artifacts of his life, and I think they have even kept making some refinements to the presentation. Something got mixed up about our appointment and unfortunately we did not have the opportunity to pray with Father Mazzuchelli’s penance chain, as I had done on a previous occasion. Certain of the numerous dear little children (these are large families) were getting tired by then and not minding. This was a long but fulfilling day. I got to have some Mound Bread (cinnamon bread to be exact) on the way home. Thank you to everyone who made this trip possible and so lovely, especially Bobibeth and Father Alex Navarro, as well as those who gave us tours and assisted us at the locations–and thanks be to God. Some may also be interested in my article that was in the Madison Catholic Herald about Father Mazzuchelli and the New Evangelization. Elizabeth, I cannot help but believe you are a spiritual heir of Ven. Samuel! I say that you should found a “successor” community of the Sinsinawa Dominicans. If she walks, talks, and acts like a true religious…then she must be. If you read French, you might wish to explore the site of the Dominicaines du Saint Esprit, from France. Dear Michael, thank you. No, I don’t speak French! There is actually a small Dominican sisters community (which is a member of not the LCWR but the “other” superiors’ group, the CMSWR) in new Jersey called the Dominican Sisters of Divine Providence that was founded by a former Sinsinawa Dominican. She had made a new translation of Fr Mazzuchelli’s Memoirs in the 70s, and I have wondered if she named her new community partly from the inspiration of Fr Mazzuchelli’s notable devotion to divine providence. There are also, of course, the Ann Arbor Dominicans of Mary, Mother of the Eucharist, and the Nashville Dominicans of Saint Cecilia. But I am pro-Sinsinawa Dominican! I think it is practical common sense that to continue they need to get vocations of women who don’t have a beef with the Catholic Church but are happy to be part of the mission of Jesus and the Catholic Church and Father Mazzuchelli. I think that I was told they currently do have 5 women who are postulants or novices, which is better than it has been, but they have also not had a great success rate retaining vocation candidates. 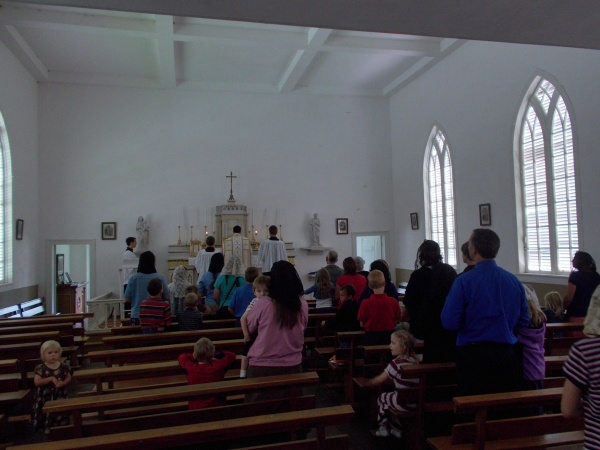 The community needs to not be inhospitable to women who hold orthodox beliefs and have standard expectations of religious life such as living in community, apostolate (such as teaching) in common, praying the Liturgy of the Hours, praying the rosary, daily Mass when possible, Eucharistic adoration, even wearing a habit. Sister Kathleen Ashe, one of the Sinsinawa Dominicans, who, as a member of the radical feminist group, National Coalition of American Nuns, co wrote their statement advocating transforming communities of Sisters into non canonical communities, independent of church authority, has died. Sister Kathleen also served as prioress of the Sinsinawas for awhile. We should pray for this Sister, of course. However, as the old guard of the 60s diminishes, the Sisters may be more accepting of traditionally minded candidates. Yes we should pray. I had a Mass said for Sister Kaye when she passed away. She figured in a large way in my chapter on the faithful Sister Francis Assisi Loughery. She was one of the most radical. I don’t think I am aware of an NCAN statement promoting transforming religious communities into “non canonical” communities though. It’s not out of character for that group but I am not aware of such a statement by them. Do you have a reference? Unfortunately “non-canonical” discussion within the Sinsinawa Dominicans has not gone away. 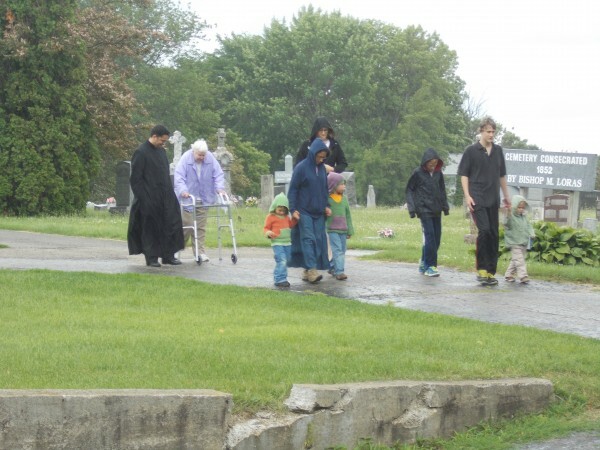 The Sinsinawa Dominicans and their lay Associates are just about to gather for their annual Community Days gathering at Sinsinawa Mound which I think starts tomorrow. I have been praying for them and I invite others to also. 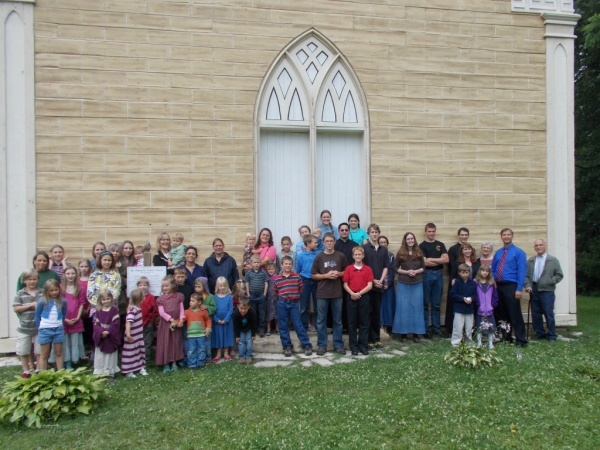 Thank you for the update on the Sinsinawa Dominicans’ upcoming chapter. I wrote, as a younger man in early 1982, a letter of protest to NCAN regarding the non canonical statement. You can reference it in Our Sunday Visitor, I believe. Finally, we should pray hard for the upcoming chapter. I would recommend the one thousand memorares prayer to be said by as many people as possible. Loved this! Thanks for sharing via BC. As a import to SW WI I really appreciate you sharing your devotion!